We caught up with SAI Rome Assistant Program Coordinator Arianna, who is contributing to our blog this month. 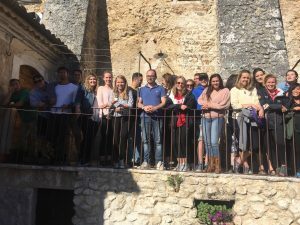 In her entry, Arianna describes a recent SAI excursion to the beautiful Abruzzo region of Italy. 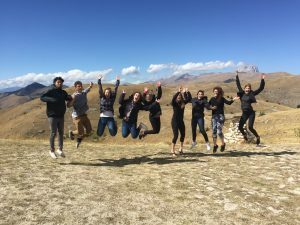 In September 2017, SAI Rome took over 50 American university students on an inaugural weekend excursion throughout the region of Abruzzo. Directly east of Rome, Abruzzo is easily accessible from the Eternal City and perfectly situated within reach of the Apennine mountain range, Adriatic coast and a number of national parks. This part of Italy remains wild and untouched, being the perfect combination for an authentically Italian experience. We began the weekend with a sunny walking tour through the city of Sulmona, known as the jewel of the L’Aquila province, home of the famous Italian “confetti” and birthplace of the poet, Ovid. The students were indulged with rich history and beautiful views of the Majella mountains that serve as Sulmona’s dramatic backdrop. After a traditional Abruzzese lunch in the historical center of Sulmona, we were indulged with the region’s famous cultural heritage and natural landscape in the surrounding area. The activities included horseback riding in the vineyards of Vittorito, hiking through the Sorgenti del Pescara natural reserve and traditional confetti making at one of Sulmona’s most famous confetti factories. On the second day, we drove across Abruzzo to the Chieti province and spent the morning on the sandy Adriatic beaches of Lido Riccio, outside of Ortona. We were lucky to have incredible weather and finish off the summer season at the beach. One of the highlights of the entire weekend was the unforgettable lunch we shared together on the Trabocchi Coast, just south of Ortona. 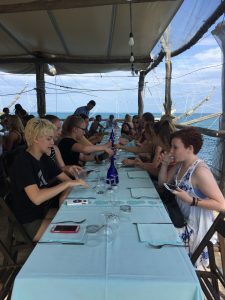 We dined at Trabocco Punta Tufano while learning about the history of the Trabocchi Coast, traditional fishing vessels native to the Abruzzo region and feasting on a typical fish meal that lasted for hours. The final day of the weekend did not disappoint. 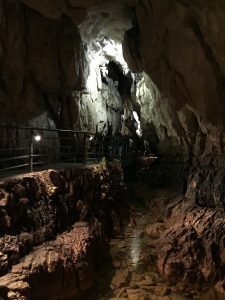 We made our way to the Grotte di Stiffe, and toured one of Italy’s most unique cave systems. We learned about how this cave system is still under formation and saw its stunning waterfall inside the cave emptying into a small lake. After departing the caves we trekked to the top of the Rocca Calascio, the highest fortress in Italy. With clear skies, everyone enjoyed the incredible 360 degree vista of the Apennines. We couldn’t leave Abruzzo without one more amazing meal. We went to the small protected medieval village of Santo Stefano di Sessanio, which is a part of the I Borghi piu belli d’Italia group. The historical restaurant we went to, Locanda sotto gli archi, is famous for remaining true to the traditions of the area. Not only do they prepare and serve typical Abruzzese dishes but the restaurant was also constructed with the use of original stones, ancient foundations and walls of the town, creating a real open-air museum. The entire weekend was a journey through undiscovered Italy. Not only was it satisfying to take students to a part of the country they would have never traveled to on their own, it was extremely humbling to be warmly welcomed by the native people of Abruzzo as we learned what makes their home so special.